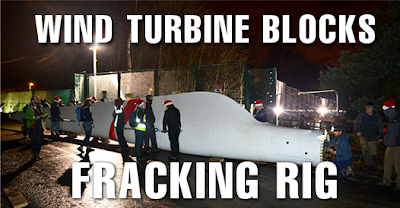 Canterbury District Green Party: Fracking test site blockaded. This morning fifty pro-renewables campaigners delivered a 17 metre, 1.5 tonne wind turbine blade as “Christmas gift” for fracking company IGas. The entrance to the Barton Moss test site has been blocked, to prevent drilling vehicles from entering.